The restaurant, which employs six people, was one of two new businesses that opened in Amherst in January. The other was the Art of Rebellion Tattoo Studio on Havelock Street. Their openings coincided with announcements that Frank & Gino’s Pasta and Grill House and the Hart Stores would be setting up shop in Amherst later this spring. It also came at a time when four of the town’s major employers in the Amherst Industrial Park – Gordon Food Service, Maritime Pride Eggs, Atlantic Windows and Weston Bakeries – were in the midst of expanding their plants. The estimated value of the expansions combined is $13 million. Around the same time, Cabinet Central of Burnside announced they would be moving their manufacturing facility into a building in the industrial park that had been vacant for more than a year, a deal to save the historic, downtown train station and turn it into a restaurant was secured, and new owners took over Bella’s Café and Bistro, renaming it Savoie Kitchen. The Howells’ decision to come to town wasn’t a snap decision. The brothers, who were born and bred in Antigonish, were living and working in Kelowna when they began thinking three years ago about starting their own business back home in Nova Scotia. “We did research on all the different towns and counties in Nova Scotia,” Howell said. They looked at population size, cost of living, cost of operating a business in a community and what type of competition they might face. They even looked at the possibility of setting up shop in New Brunswick. Part of the reason for that is the help they have received from the town, especially Marc Buske, the town’s building official co-ordinator. Then there is the reception they’ve received from customers. Lastly, they are impressed with the friendliness of the locals. 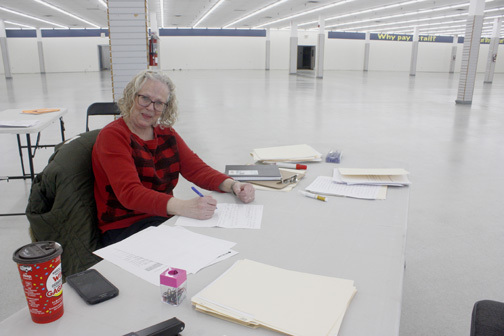 A few doors down in the mall, Audrey Renwick, Hart Stores’ New Brunswick zone manager, is conducting job interviews in a cavernous space that is empty now, but will soon be filled with everything from clothing to furniture to linen to home décor when the new retail store opens later this year. She too is impressed with the friendliness of residents and the helpfulness of local organizations. She’s also been blown away by the assistance she has received from local organizations, particularly Nova Scotia Works. “They were just phenomenal,” Renwick said. “They’re the ones who helped me get all these wonderful applications. They really stepped up to the plate. I was floored by it. I’ve never received so many applications. The Amherst location will be the first the Quebec-based retailer will open in Nova Scotia. The company also has stores in Ontario and New Brunswick. “Amherst is like the front door to a new province for us,” Renwick said. “What attracted us to Amherst is the growth potential of the town and its welcome support for new business. Renwick said they are currently hiring about 20 people to help set up the store. Once it is up and running, she expects the store will employ 12-15 people. Across town on Victoria Street, Andy Farrell is prepping for the supper hour at Savoie Kitchen, formerly Bella’s Café and Bistro. 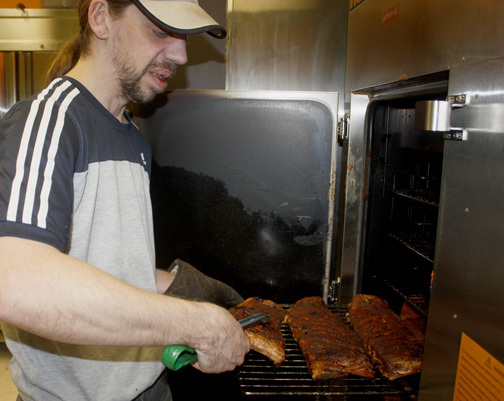 Farrell, who was born and raised in Amherst, has been in the service industry for 30 years, 20 of them in Ottawa. He moved back to his hometown about seven years ago. Then last summer he and his sister, Donna, learned the owner of Bella’s was looking to sell the restaurant. After some discussion, he and his sister, decided near the end of last summer to take the plunge and began the work needed to make an offer to purchase the restaurant. “We worked together with the Cumberland Business Development Corporation, who were incredibly helpful, in putting together a package for the sale, which went through on the 21st of Dec.,” Farrell said. At that point, the restaurant closed for a few renovations, including a new bar, a new paint scheme and new furniture. They reopened with a new name – Savoie Kitchen – and a new menu on Jan. 9. “Savoie is my late mother’s maiden name,” Farrell said. “She was the kind of person who opened her home to everyone. As far as my siblings go, all our friends essentially lived at our house. Most people just called her Mom. Farrell is confident the restaurant will succeed. 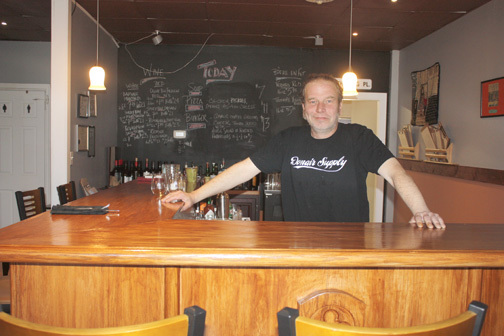 The positive attitude circulating throughout the town is another reason he believes the restaurant will be successful. Over on Industrial Park Drive, construction workers are busy at Gordon Food Service building a 45,000 square foot expansion to the 16-year-old facility. One of 40 businesses in the Amherst Industrial Park that together employ more than 1,200 people, the food distribution company arrived in town in 2003. It’s been so ideal, the company decided their Amherst expansion was required “in order to continue to grow the business across Atlantic Canada,” Godin said. The expansion, which is predominantly new freezers and coolers, “gives us a nice platform for growth” and it will impact employment, he added. The town, Godin said, has been very helpful along the way ensuring the business received the proper permits and answering questions in a timely fashion. Gordon Food Service expects the work on the expansion to be completed in late April or early May. A couple of blocks over on Chandler Road, the employees at Atlantic Windows have already moved production lines into a 22,500-square-foot expansion that was added onto their 44,000- square-foot manufacturing facility. 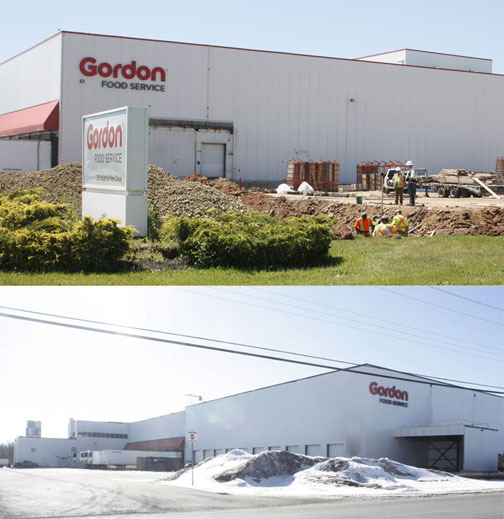 Like Gordon Food Services, the 36-year-old company that is headquartered in Port Elgin, N.B., established a production facility in Amherst 11 years ago because the town’s strategic central location in the region gave them access to all the Maritime provinces and a straightforward route to Newfoundland. Amherst was also a natural fit, he added, because it is just 25 minutes away from the main plant in Port Elgin where the firm produces its windows. 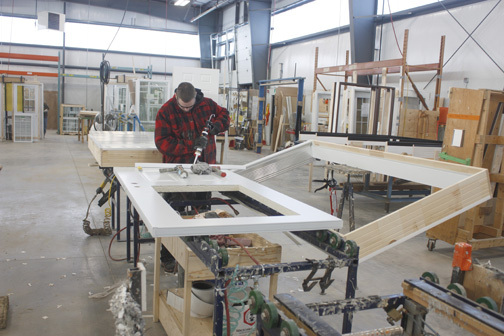 The Amherst plant builds all the firm’s swing and sliding door entrance systems. The expansion in Amherst comes three years after the firm built an 11,000-square-foot expansion to their Port Elgin plant. “We’re committed to both communities,” Dickie said. The Amherst plant currently employs about 50 people. Dickie expects that number to grow to 75 thanks to the expansion. Dickie said the Town of Amherst has been very inviting and helpful, both when they came to the town and when they decided to expand. The community, he added, has also been very welcoming. “We feel like it’s our second home. The ease of hiring new people, we never have issues trying to fill a position. The people are just amazingly hard working. They take a lot of pride in what they do, and they want to make things better.